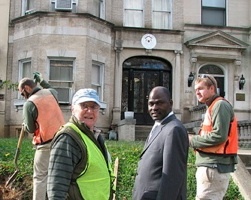 As a Treekeeper with Restore Mass Ave, I enjoy outdoor work with fellow volunteers and building relationships with the interesting people along this famous street, widely known as Embassy Row. For example, I have become acquainted with the Embassy of Togo (2208 Mass Ave). The land between the Embassy and the public sidewalk looked to be a fine site for a new tree. RMA hoped to plant there one of a new row of stately trees. Why? 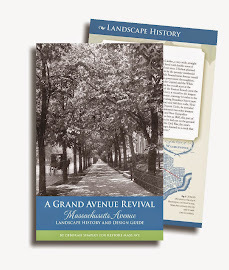 Because a century ago, parallel lines of large trees formed allees along Mass Ave sidewalks for miles. We're trying to bring back a bit of that beauty. Ambassador L.E. Kadangha Bariki in front of the Embassy of Togo as the hole is dug for the new tree. A number of fine old mansions on Embassy Row are being renovated. But heavy equipment, debris piles and truck traffic threaten nearby trees. 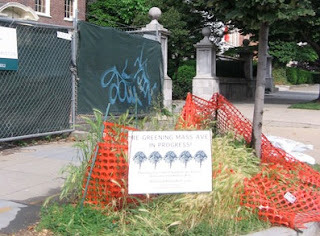 Construction activity can swiftly undo our work nursing trees in sidewalks and yards and wreck Mass Ave's future beauty. Catoctin Construction is undertaking a complete restoration of the Cameroon Embassy (2349 Mass). It is one of Mass Ave's most famous Beaux Arts "palaces;" RMA and Casey Trees planted two new elm trees with the help of the Cameroon Ambassador in 2009. So I approached the construction crew. Jeff Scott, Catoctin's project manager, has been wonderful to work with. His crew put orange fences around the two young elms. They sodded the lawn so the site will be pleasantly green during the renovation. The crew also waters regularly a new cherry tree we planted across the street; as a result it did very well in last summer's heat. RMA Treekeepers create a micro-environment of good, aerated soil and water that the city sidewalk trees need to reach mature size. I get to do all this in the company of (mostly) young men and women who share this happy therapy of "playing" in the dirt. 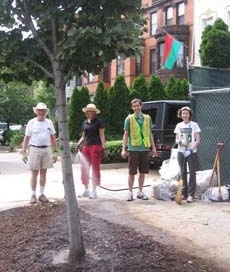 I'm on the left, in the hat; Nancy Ricca is watering a city linden tree after we weeded and mulched its tree box. In case you don't believe this tree needed help, below is how it looked before we started our rescue operation. Finally, on my walks with the city Urban Forestry Administration forester to inspect these sidewalk trees, we discuss each tree's condition and define our respective roles. To date RMA estimates that the city has planted about 100 trees in Embassy Row sidewalks to replace dead or dying ones and fill in empty tree boxes. Separately, RMA has arranged more than 120 new trees for lawns and yards, including the "second row" elms at the embassies of Cameroon and Togo. Actuarial tables suggest I am unlikely to see the ultimate fruit of my labors, though the image of the allees of trees that graced the sidewalks a century ago*** are an inspiration. But there are more immediate rewards, too. *See www.RestoreMassAve.org/events for our planting of 16 trees with Casey Trees October 22, 2010. ** The shaded allee of 1913 is at http://www.restoremassave.org/historical.shtml . Very nice blog it's thinking about the trees .